Enough of this drawing nonsense....let's try something better. A third game, a third 9th move. After trying e5 and f5, Short tries a new plan with 9. Qf3. The basic idea is similar to 9. f5, where a key idea is opening the diagonal of the light-squared bishop. Here the queen supports f5 as well as indirect pressure on f6 in some cases (after Bg5). As we'll see Short had a more revolutionary idea in mind. Notice that Short consistently rejects the quiet lines, such as the perfectly acceptable 9. O-O. As in games 6 and 8 Kasparov favors this positioning of the knight, although after this game Kasparov gave up the Nb8-d7-c5 maneuver altogether, having obtained difficult positions in all cases. The product of Short's home analysis, though apprently he realized its flaw over the board, which led to an hour-long think that came back to cost him later in the game. Short's idea is the queen sacrifice which he ultimately executes in the game, however the concept could have been refuted. Kasparov: "…the simple 14. … Nd5 15. Bxe7 Nxe7 16. Qg3 d5 leaves Nigel strategically lost because his bishop on b3 is out of play and I can win automatically by advancing my queenside pawns." But Short's uncertainty at the board may have bluffed Kasparov into thinking the loss of a queen had simply been missed during analysis. But this is precisely the position Short had aimed for. A series of forcing moves gives White a winning position. 22. d7 Rd8 and from here to the end, Kasparov is one pawn move away from disaster. For the queen Short has a rook, piece, and a monster passed pawn. In Keene's book on this match, kindly provided by Lou, Kasparov points out that 23. … Bd6 is met strongly by the simple 24. Nd2 when Black's army gets disorganized, but it sets a trap for 24. Rd1 when 24. … Bxb3 25. Nxb3 e4 gives Black excellent, possibly winning play with his own passed pawn. Now White is perilously close to a win, but Kasparov is giving himself potential lifelines with mating or perpetual checking threats against the White king which is exposed on the light squares. Also, Short by this time was already in significant time pressure. 28. Nxe5 Qxh2 The pawn on e5 was gold, the pawn on h2 was silver, a good transaction. With a clever tactical maneuver, Short eliminated Black's defense of d8 and exposed Black's king. For the next several moves, a modestly powered laptop can find winning variations for White…but for a human sitting across from the greatest player of all time with only minutes to play, the problem is more complex. Short: "[It was] possible to play 32. Re6+ Bxe6 33.Nxe6 Qxe6 (33. … Qxd7?? 34. Nf8+) 34. d8 = Q which is winning. However, I thought that Black may be able to cause some problems in my time pressure by running his h-pawn down the board so I preferred to try to win the game immediately. Indeed, the Q+N vs Q ending Short cites would undoubtedly have been tricky under these conditions. Here the press center was calling for 35. Ne1?? which is very likely to have been what Short was planning in rerouting his knight from e6 to d3. However, this loses! 35. … Qg4! threatens the pawn on d7 and mate on d1, and after 36. NxB Qxd7 there is a fork winning back the piece, and the game. The last simple win was here, when after 37. Rh1+ Kg6 38. Ne5+ Kf5 (38. … QxN?? 39. d8=Q) 39. Nc6 [Short] there are no mating threats and White will queen. 8. f4 Nc5 Reaching the same basic setup as in game 6, where 9. f5 was played. A rarer plan but one fully deserving of attention. Short intends to take advantage of Black's slowed development and the inconvenient location of the king in the center. Black has taken significant liberties with ...a6 and ...Nb8-d7-c5 so White can usually contemplate violent action in the center. e6 will be a target for piece sacrifices. Having supported his e5 point, White can continue in the style of overprotection with Qe2 (most popular), or with Short's sharper choice in the game. Kasparov responds to fire with fire. Black has a somewhat poor record in the 12. Qg4 line, see for example this master class in destruction: Kasparov tries to radically weaken White's center, after which Black might even gain an advantage with piece activity. However, with his superior development White will have the first say. And the piece is not accepted. In what follows, notice how if Black takes the bishop, tactics are based on the utter lack of space around the Black king and queen - mate is constantly threatened as is trapping the queen. With ...Qe7 Kasparov shores up e6 which is otherwise a target for sacrifices. In the main variation - [ 15. ...gxf4? 16. Nxe6! Nxe6 17. Bxe6 Qe7 (on...fxe6? I'm guessing that 18. Qxe6+ Qe7 19. Qg6+ Qf7 20. 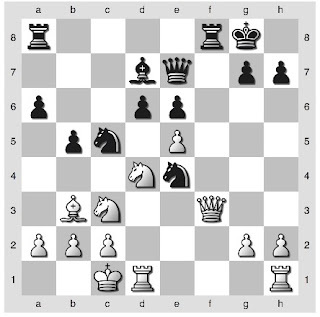 Qe4 threatening the rook and a pawn fork is pretty bad; no computer used so consume with caution) 18. Bxd7+ Bxd7 19. Qf3 Rc8 20. Nd5 Bc6 21. Nf6+ Qxf6 22. exf6 Bxf3 23. Rhe1+ gives White an overwhelming position (Short) ]. By the way you can try out all these lines yourself on the chessgames.com game page (link at top of page) just by moving the pieces around creating variations, a very nice feature. Black is catching up, but it turns out White is now very close to a win. Using Yaacov's logic it is easy to see the Black is weak on the dark squares around his king. But how to exploit this? My first instinct was to try 20. Rxd7?, further attacking the dark squares and giving white Nf6+ later on. But of course 20.... KxR is near winning for Black since the king will hide on the queenside. Short's solution is elegant, combining attack on the dark squares with attack on the weak light squares near Black's king (temporarily and locally weak because of Black's misplaced queen and bishop). White is now down a rook and the exchange for a pawn, but Black's rooks are still not in the game and his king is in a horrid place. Naturally the game ends in...a draw! After an apparently sufficient defense, Kasparov slips and gives Short a winning shot. In time trouble, Short missed the paradoxical 38. Bd4! which prevents the perpetual check used in the game. The key line is 38. Bd4 Qh1+ 39. Kd2 Qxh2+ 40. Kc3 Rc8+ 41. Kb4 Rc7 42. Qg5 Qg6 43. Qxh4+ Kg8 44. Nh6+ Kf8 45. Qf4+ Ke7 46. Qc7+ Ke6 47. Qxb7 Qxh6 48. Qxa6+ +-. Simple, right? Disappointing for Short, who had played an inspired attack and had his opportunity. A very instructive game combining several elements of attacking strategy.